This time we decided to sail from Athens on a one-way charter to Melos (Milos) just outside the high season (last two weeks of May). This is the first part of the logbook that describes this adventure. Click on the thumbnails to see a larger 800x600 photo in a new window. After landing safely on the - now remote - airport of Athens, we got acquainted with Miss Galaxy : A Beneteau Oceanis 440. The eight of us embarked early in the afternoon and decided to continue for the Island of Angistri instead of Aegina (see the map below). This way we would avoid the tourist crowds in Aegina, moreover, we would be farther ahead of the other charter folks who were still waiting to get their yachts. As soon as everyone was settled in, it was time for some exercise in the form of steering figures of eight (lot's of figures of eight). After the dizzy spells wore out, we got the sails up for the first time and slid swiftly past Aegina on a broad reach. Due to a major wind shift we found Angistri harbour to be on the lee shore, so we proceeded to a little pine rimmed bay on the west corner of the island. The excellent and indispensable Greek Waters Pilot by Rod Heikell did not describe this inlet, so we made a careful approach and anchored in 5 m. at N 37° 41.893' E 23° 19.840'. It can easily be identified by the road leading away from the shore (see photo). Very attractive and peaceful. Today we set sail for Palaia (meaning “old”) Epidauros, which is famous for its perfectly conserved amphitheater. The morning consisted of a nice swim and a superb English styled breakfast. Then, getting the anchors up brought a surprise: the stern anchor was just lying flat on the bottom and had apparently been dragged along over quite a distance. Luckily, our main anchor did proof more trustworthy. The little harbour of Palaia Epidauros was a treat. First of all we were the only ones, but more importantly it proofed to be a very hospitable place. By taxi it took 15 minutes to get to the wonderful amphitheater and this taxi waited there for an hour there to get us back for just €25. Friendly Maïk of Maïks Hotel allowed us to shower in one of his hotel rooms and served delicious food as well. 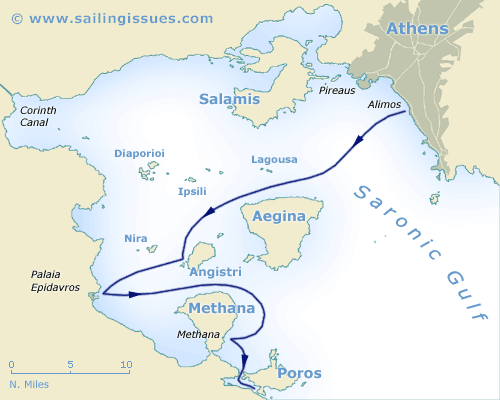 After dealing with an extensive list of victuals we cast off and set sail to Methana and then on to Poros. We were fascinated by the stories about Methana, which was supposed to be very foul smelling and had “healthy” sulphuric baths. Indeed, the whiffs of H2S, bubbling up to the surface of the harbour, took our breath away. Yet, further inland the air cleared and there the green lush vegetation of the fertile volcanic soil took our breath away as well. For some of us it was a great disappointment to discover that every spa was closed in the off-season. Uncured and with a little less life expectancy we reached the beautiful city of Poros, which is truly a spectacular sight. We took the yacht stern-to the south quay, right next to the Tourist Office and the self-proclaimed “Internet/Yachting cafe”, where I updated the website.